The photos in this post are from the blanket I am making for youngest DD. It is my current swedish weaving project. I have made a lavender one for oldest DD and a brown one for my son...and each got their blanket on their Birthday this year....technically I don't have to finish this one until youngest DD's Birthday in July, but I will have it done by mid April probably and since she knows about it...I'll give it to her. 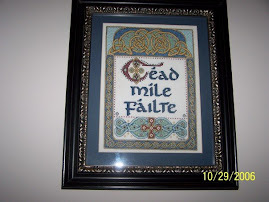 I've also made a couple for our family room, and I have another on the back of my stitching chair...as well MIL got one for Christmas and neice got one for her Birthday last year....see a pattern here???? LOL Oldest DD requested that I make one for her boyfriend for Christmas this year, so I will. My cousin brings back the monk cloth from Florida for myself and another cousin...she gets it much cheaper than here in Canada. This is what we do weekly at BLANKET CLUB..(well we also eat and chat). 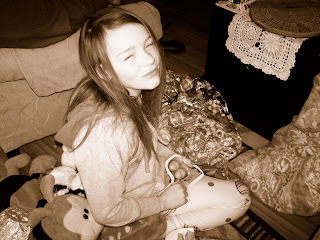 The second part of this post is a "THANK YOU" to all that have left comments on my blog! I LOVE seeing them and greatly appreciate each and every one!! Thirdly, a random question that I will pose to each of you that read this, and if you have a comment on it...I'd love to hear. I have a set of "Golden Treasury of Knowledge" junior encyclopedias that I got many MANY years ago from my grandmother. These pose no real use in todays world with computers..etc...they have been on a shelf in youngest DD's closet for quite some time...and I have put them in a rubbermaid container this morning....my question...what do I do...do I toss them? Do I keep them? If I keep them, what would be the value of them other than the fact that my grandmother gave them to me? Your opinions for or against keeping would be appreciated!!!! Well, I tried to get some shots of the kitchen, the way the sun was shining, I didn't get all the angles...so I'll try another time. 1. The first photo is looking at the side wall from the dining room...that's my grandmother's china cabinet beside the microwave. 2.This is the back wall, my antique sewing machine and another smaller china cabinet from my dad's side of the family. 3. Looking from the back door into the kitchen. 4. I am now standing at the back wall by the sewing machine..looking towards the cupboards. 5. This is the small wall between the kitchen and the dining room/den. I haven't been ignoring my blog. I've been busy cleaning and decluttering the kitchen...I'll post photos on the weekend, hopefully. I've come down with a cold...not a bad one, just mostly sniffle and feeling tired. I decided that since it's snowing out and I was a little under the weather, I'd make some chicken soup...so that's going in my crockpot. No plans for the weekend...probably get some things done around here and catch up on some reading. The weather isn't sounding too good and I don't venture out in the snow....so....don't really have a choice. The weather for today is 5-10Cm of snow!! A joke, right?? I mean it's spring!! I do hope this is wrong, we really don't need anymore snow this winter!! So, yesterday I worked hard in the kitchen. I got the pantry reorganized and also did the fridge and some of the cupboards...looks good. I have some more work to do in there and then back to youngest DD's room for decluttering. I am anxious to get to work on her room. We are eventually going to paint it (two walls pink, two walls blue according to DD) and put laminate flooring in there...it will look very nice. BUT I have to get her to pack away some of her toys, or get rid of them, whatever the case many be. Anyway, eventually I will post some photos of my work in progress and the kitchen. Soooo..this bright and sunny morning youngest DD and I head out to do some shopping....I did have an alternate reason for going...oldest DD had her own plans, DS was working on his dirt bike and DH had the intentions of painting the bathroom ceiling in the kids bathroom. Now the time has come that we need to do painting...our house was planned and designed by us several years ago...it is unique in the fact that it is a mini home with a complete basement...about 2400 square feet up and down inclusive...so not too bad for a family of 5....anyway, as I said...the time has come that walls need to be painted and ceilings...as they haven't since this place was new (except for the basement, which was finished less than 2 years ago)...so DD and I head out.....decide to stop for breakfast...do some pleasant shopping and I figure that when I return hours later, the ceiling will be done...WRONG! I come home to a "mess"...seems that when DH started painting the ceiling the "stucco" finish crumbled!! We aren't sure why this happened, and in the end it's probably much better...he is going to take it all off and we will finish it as a flat ceiling. I just was not expecting to find my shower curtain and window curtain in the front hallway, and assorted bathroom items scattered from hallway to livingroom! Let's say, all things considered...I'm glad the long weekend is over and school goes back tomorrow for the kids and work for DH..I really need to get my house in order again!! As soon as everyone got up, the kids opened their baskets and then searched for eggs...DH and I made a late breakfast, which was delicious, and I think for future reference, this is the way for us to go. The rest of the day we can munch, have a salad, whatever. Oldest DD and boyfriend have gone to a movie and youngest DD and DS are outside enjoying the sunshine, cold temps and flurries in the air! The eggs are hidden, the coffee is brewing, the kids are sleeping....LOL....I'm the only one up at the moment! It is snowing here yet again!!! Anyway, must get a few sips of my coffee before the household wakes up! My son has taken it upon himself to bake recently...my dad was like that...he loved to bake...my son always makes the same recipe that my dad did...we all call them "Grampie's Cookies. Here are the Easter Baskets as promised. I'm happy with how they turned out! Well, things didn't go quite as planned...it started to snow last night and there was a little too much for my liking this morning, so DH and I went out instead...I didn't get to leavae as early as I had hoped, but we did have a really nice time out...we got to go to brunch and we got groceries...also a few phone calls from the kids WHILE we were out!! Okay, so the kids had no school yesterday because of the ice storm, today we were all home, plus oldest DD had a friend here......I'm going a little stir crazy!! I am hoping (fingers and toes crossed) that I can get out of here tomorrow morning before anyone else is up....I'm heading for a tea, then to my favourite second hand shop to browse....Wal-mart for a couple of "decorations" for the Easter baskets and to pick up an Easter treat for the dog......take a nice country drive to my favourite little grocery store...then home!! Think this is possible??? I sure hope so. One thing that may hold me back is the fact that my new car only has summer tires on and we are still experiencing some winter weather......but the forecast sounds favourable. At some point tomorrow DH is supposed to paint the ceiling in the kids bathroom. This is in dire need of getting done, so I hope he finishes it tomorrow....our big plans for later in the spring is to paint our bedroom and put laminate floors in it. I have a colour picked out for the walls....oldest DD refered to it as "pee on the wall"....LOL...but I love it! I can't wait to get that all done. I'm just randomly blogging at this point, so I think I will end for now. I told youngest we'd watch a movie tonight....so I'll get her inside to watch it. Have a good evening everyone!! Today Sara asked me if we could dress her bears (I realize they aren't all bears, but it's Build-A-Bear animals)for Easter, so we did, placed them on my bed for a photo shoot and they are now back on her bed. 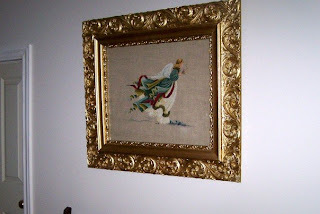 I've got some cross-stitching friends that read this blog, so decided I'd post some of my stitching. These hang in various parts of my home. 1. Angel of Light...did this for mom and dad and gave it to them for Christmas....2000. 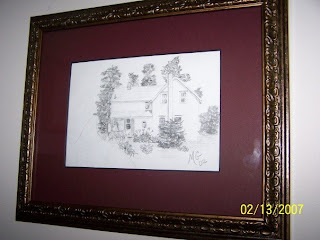 After they passed away, I reframed it in an antique frame mom had. This hangs in our family room. 2. 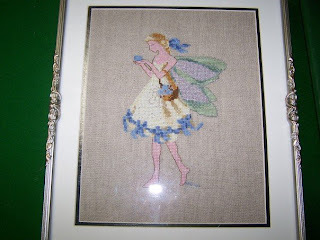 Mirabilia Easter Fairy....this also hangs in our family room. 3. 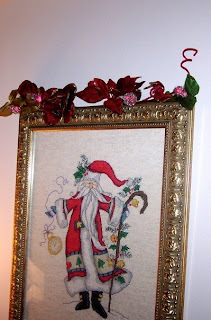 Santa...this was a kit and I really enjoyed doing this one. alone, to hunt for goodies for the Easter Baskets for the kids and also things for the Easter Egg hunt. 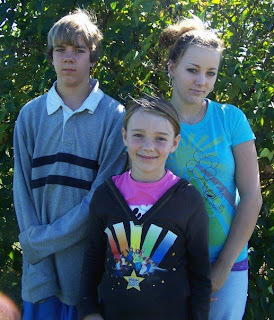 Now remember, these "kids" are 17, 14 and 10...and DD's boyfriend who is 18! He will be spending Easter Sunday with us, as his family have gone away to visit relatives and he is working most of the weekend. (He works many hours a week and goes to university as well)...so....they just do not want this tradition to end, and I can't say that I blame them!LOL I had fun picking things out...and I had to be extra careful with dd's boyfriend as "D" is allergic to chocolate! Once I get the baskets all done up, I'll post a picture. 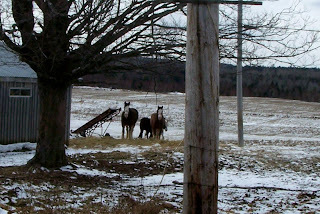 We had a really nice sunny day here....chilly, but sunny.....weather for tonight is freezing rain/ice pellets! UGH!!!! Anyway, have a good evening everyone! It sure doesn't seem like it!! 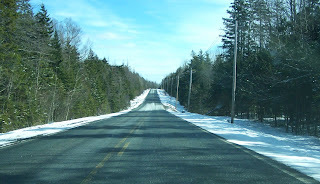 Yesterday was sunny for the most part, but COLD and high winds...the salt truck/snow plow kept going by our house all day as the snow from the weekend kept swirling around and making the roads slippery and for some reason in front of our house was really bad. I got a good start on DD's room yesterday...still more to do, but I don't think I will get to it today. I have to take my old car out to our mechanic's this morning, as he is going to sell it for us. 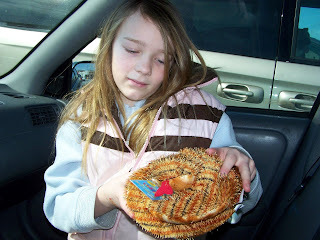 Then I have to go and get some Easter goodies, and this afternoon youngest DD and DS have dentist appointments, so that means I have to pick them up at school. Tonight youngest DD has her gymnastics class, so that's today and this evening gone. I really don't think the winds have died down any since yesterday...I can really hear almost howling outside! I hope this doesn't mean the roads will be snow covered in spots. Good morning everyone! Ths sun is shining brightly here this morning....quite the contrast from yesterday. We got more snow yesterday afternoon/last night, but today's sunshine makes up for it. Mixed emotions about today.....the kids go back to school tomorrow....while I will be able to get my house in order again, it's nice to not have to get up at the crack of dawn and be on schedules. I thought I would add that we had a great time...we got LOTS of goodies at the bakery and mine are almost GONE (that's what 3 kids and friends over do!!! )....I got biscuits, brown bread, two dozen oatmeal chocolate chip cookes, two dozen oat cakes, and one dozen ginger snaps! Yum! Judy and I had lunch at the cafe beside the bakery...I had salad, quiche and coconut cream pie...she had fish chowder, biscuits and pie....it was all very good! WEDNESDAY.....HUMP DAY AND SPRING BREAK IS ALMOST OVER! I could say that today was uneventful, but actually it was eventful! I got a "New to me" car today....a 2005 Sebring! It's beautiful, and I really like driving it, but it comes with mixed emotions. For the past 3 years, I have had my dad's 2000 Toyota Camry and it has been a fabulous car, but at the end of this month, it will be a 9 year old car and the fact that nothing has gone wrong with it in the years I've had it, leads me to believe that something WILL go wrong soon and it would be big bucks to fix...AND even if I did fix it...I'd basically have a 9 year old fixed car. So......I moved on. I say thank you to this wonderful car....and I hope that the new owner, whomever that is, will take pride in it and enjoy it as I have. I know my dad would say I made the right decision. I had planned on doing some work on my blog today, but that didn't happen. Oldest DD had car problems, so this resulted in Dh taking her car to our mechanic, and me driving oldest DD to a Dr appt (she seems to get alot of colds, but she works at the sports stadium teaching swimming and lots of kids around)...after dr appt and ordering prescription, we went to Subway for lunch (oldest DD, me and youngest DD). then Wal-mart and after dropping oldest DD off at work, youngest DD and I went to a Toonie Movie......Alvin and the Chipmunks....we really enjoyed it and it got lots of laughs. Have a great evening everyone!! Okay, it's day two of spring break.....oldest DD has a Dr appt in about an hour and a half....she doesn't want to "hang around" town by herself until she has to go to work....youngest DD wants to go to one of the "Toonie" movies playing this week....only problem is...time wise...it doesn't work for what oldest DD wants...and DS hasn't gotten up yet, but I doubt he will want to do either of the above...LOL....so....we'll see what happens....on a bright note.....THE SUN IS SHINNING! 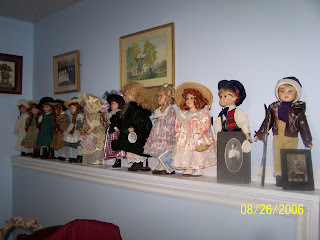 Katy, in the coming days, look for more posts here about my sewing room, and some updated photos....the dolls on the ledge in my sewing room is a collection started by my mom almost 20 years ago. She gave me an "Anne of Green Gables" porcelain doll and over the years added to my collection. It was easy for her to do this...she was in the beginning stages of alzheimers and couldn't make decisions..and never knew what to get me for Christmas, or my Birthday, or Mother's Day....a doll was an easy choice. I have dolls not seen in this photo and my mom didn't give me all of these, but I cherish the ones she did. 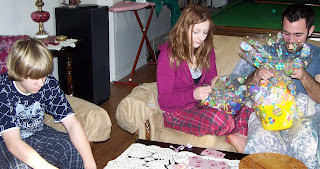 The other photo is my youngest DD in her flannel nightgown with a matching one for her doll....December 2006...I sewed this for her. So...youngest DD and I head out on our adventure this morning...we decide to take the camera with us and take a couple of photos along the way. It's a nice drive...very calming......after browsing a couple of stores, I was "persuaded" to get another Webkins for DD....so "Slither" has joined our household. 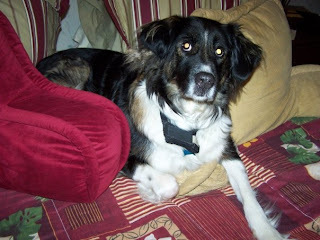 This is our 10 year old border collie mix...Nala...or as we call her "Nallie". 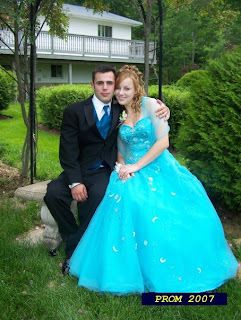 This is a photo I took last June of my oldest DD and her boyfriend of two years...it was his high school graduation. I think they made a nice looking couple....I refer to this photo as THE PRINCE AND THE PRINCESS. I have no idea what this week will bring. My goal today is to successfully entertain youngest DD. Oldest DD is going to be working later today, DS has gone to his friend's.....so it is just youngest and myself. Problem is, I don't really know what I want to do today. I suggested that we go for a nice drive and go to a grocery store we both like to go to..(beautiful country drive) and pick up some healthy foods for a stir-fry for supper.....and while there can also make a pit stop to a store DD loves to go to....so that seemed to satisfy her for the moment. The theatres around here a showing Toonie Movies all week in honour of March/spring break, however there is only one that we would consider going to...so that is a possibility for another day. My goal this week is to meet our new "neighbours"..again with youngest DD, as they have kids around her age. (but are bussed to a neighbouring french school, so do not go with my DD) These neighbours moved in just after Christmas and we have met their DS, but not the DD...I'd also like to meet the mom, as I think she is home all day like me. I'm not sure if that will happen today though, as it is a little too cold for a walk up the road....we'll see what tomorrow brings on that front. Yesterday I got out all my cross-stitch friendship blocks from an exchange I was in a few years ago...I had never done anything with them....I have 14, and have decided that the time has come to make a quilt with them. I cut them all to the same size, and one warm day soon will gently wash and dry them...and press them, then decide on fabric to be used for a quilt. This blogging is much harder than I thought!! Okay, so twice today I had an entry typed and photos uploaded and the computer logged me off!!! I am on the laptop so I don't have my photos to upload, so that will have to wait until another post. Today the kids finished up school for spring break. Not sure what we will do, or where we will go, as oldest DD is working at the pool next week...supervising, since there are no swim classes to teach. Anyway, let's see if I can get this posted before any incidents. Ah, the joys of living in Eastern Canada....went to bed last night and it was snowing, woke up this morning and it was snowing.....ugh! Oldest DD is supposed to work tonight (she teaches swimming).....I was hoping she would be able to drive to and from work, but with the snow...not likely. I may get a chance to post more later...for now my tea awaites. and I have to say, I feel very blessed. I had a phone call this morning from my wonderful friend Betty, and it turned out that she came to visit me with her significant other...with a cake...now the thing is....she lives 125 miles away and a snow storm was predicted for this afternoon! Now that is a friend! I love her dearly. I received some wonderful cards in the mail this past week, and my kids each had something for me this morning......a good day indeed. Hubby brought home some pizza, so no need to cook! All in alll a truely wonderful day.